If governments would collect their necessary revenue in the form of site rents, resource rents, monopoly rents and licence rents — all of which, by reason of their origin, accrue preferentially to the rich — they would not find it necessary to impose “progressive” taxes on earned income. Hence they would not face the following dilemma: If you want to give an income-tax cut to people on low incomes but not to those on higher incomes, you need to increase the marginal rate on incomes in between, in which case your political opponents — or rather your fellow income-taxers who masquerade as your political opponents — will accuse you of wanting to raise taxes on people whose incomes are “in between”, although in fact these people will pay less tax than before. 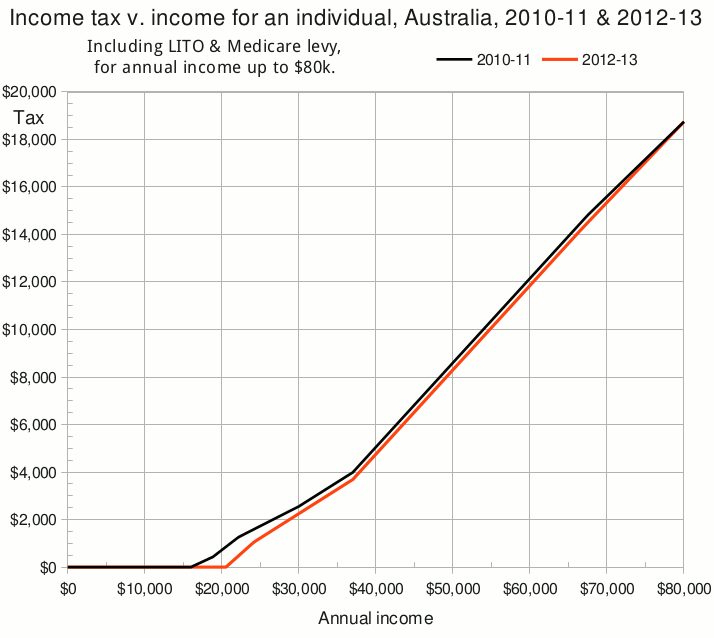 For incomes between $16k and $80k, the red curve is below the black curve, indicating tax cuts. To confine the cuts to those earning less than $80k, the two curves must meet at an income of $80k.† Therefore there must be a certain income threshold above which the red curve is steeper than the black curve but still below the black curve — that is, a threshold above which taxpayers in 2012-13 face a higher marginal tax rate than before, but still pay less tax than before. That threshold happens to be $67,500. But that is not the only income range over which the red curve is lower but steeper. The other is from $20,542 to $30k; and the difference in slope over that range is not uniform. 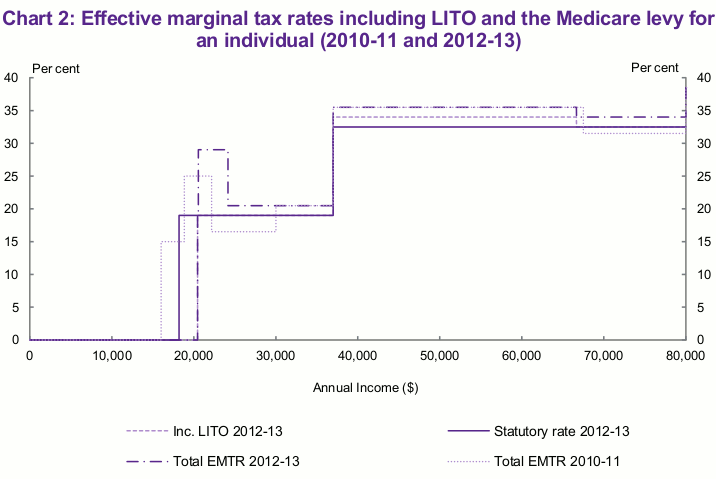 The Low-Income Tax Offset (LITO) is an income-tax rebate for low income earners. The rebate is non-refundable, meaning that it is not allowed to exceed the tax otherwise payable. It is “withdrawn” at a certain rate (the taper rate) for income in excess of a certain threshold; that is, it is reduced by so many cents per dollar of income over the threshold. Hence, at a certain higher threshold (the cutoff), the rebate is reduced to zero. The LITO is equivalent to a tax cut for incomes below the cutoff, and its withdrawal is equivalent to an increase in the marginal rate between the threshold and the cutoff. Thus the LITO achieves nothing that could not be achieved by adjusting the statutory income-tax rates and thresholds — except to hide the increase in the marginal rate! U = L / 0.85 . Thus the “levy” with its “exemption” and “withdrawal” achieves nothing that could not be achieved by adjusting the statutory income-tax scales, except to hide two facts: (i) it's a tax hike, and (ii) between the thresholds, it raises the marginal tax rate by 10 percentage points! $67,500 to $80k:     31.5%  (LITO gone). $66,666.67 to $80k:  34.0%  (LITO gone). These rates agree with those given by John Humphries, 25 June 2012. The two sets of marginal rates were used to compute the above graph of tax v. income. They are shown directly in the following graph, which appears on p.10 of the Tax Forum Discussion Paper. The relevant curves are “Total EMTR 2010-11” and “Total EMTR 2012-13”. The term “effective marginal tax rate” (“EMTR”) normally refers to the combined effect of income tax and withdrawal of welfare. In this context, however, we include no welfare payments, but only taxes and non-refundable tax offsets. I therefore submit that the word “effective” is redundant. The personal tax reforms announced in the Clean Energy Future package address some of these issues by raising the tax free threshold, adjusting some statutory rates, and cutting the withdrawal rate of LITO by 2.5 cents in the dollar. These reforms make the tax scales more transparent and reduce reliance on the LITO to deliver tax relief. That's unduly flattering. Making the scales “transparent” requires the abolition of the LITO and the Medicare levy. I concede, however, that the decision to increase some marginal rates — and even two statutory rates — was, as the fictitious Sir Humphrey would say, “courageous”. It has been seized upon by those who find it convenient to focus on marginal rates rather than the actual tax paid. But, to return to my opening point, the surest way to put an end to numerical jiggery-pokery with income-tax rates is to get rid of taxes on income per se — preferably in favour of collecting economic rents. * 2011-12 is omitted because the tax scales were affected by temporary disaster-relief measures. † Actually the curves don't quite meet; those earning more than $80k received a tax cut worth a princely $3 (per annum). ‡ The effective tax-free thresholds are quoted from the tax-reform page but may be calculated as follows. Let income E be taxed at a bottom marginal rate R above a threshold T, and let the full value of the LITO be V. Then the effective tax-free threshold is where the LITO exactly balances the tax otherwise payable, i.e. where R(E-T) = V. Solving for E gives E = T + V/R, if this is within the bracket at which the bottom rate applies (which it is).